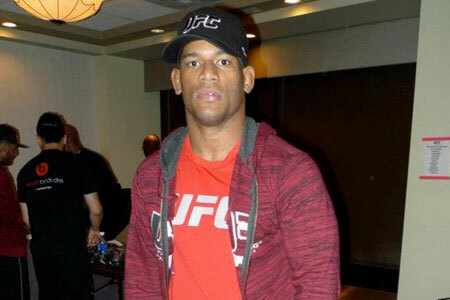 A middleweight scrap between Hector Lombard (Pictured) and Tim Boetsch served as the co-featured attraction in Saturday’s “UFC 149: Faber vs. Barao” pay-per-view broadcast. Scotiabank Saddledome in Calgary, Alberta, Canada is hosting tonight’s festivities. The show is headlined by an interim bantamweight title affair between Urijah Faber and Renan Barao. Boetsch dives for a takedown to no avail. Lombard lands an uppercut and scores a takedown. They get back to their feet. Boetsch doing a good job of using front kicks to keep Lombard at bay. Boetsch lands another solid leg kick. Lombard is winging heavy leather, but hasn’t landed anything significant. Close stanza to score. Lombard clocks him with an overhand left. He follows up with two unanswered punches. Boetsch continues to pound away on his opponent’s lead leg. Crowd once again voicing their displeasure with the inactivity inside the Octagon. Lombard lands a kick to the body and pounces. Boetsch fights his way back up and appears to have recovered. Lombard will likely win, but this isn’t what UFC brass expected from him in his highly-anticipated big league debut. Boetsch’s shot gets stuffed. The crowd is really letting them have it. Lombard picks him up and slams him to the mat for a brief moment. Boetsch nails him with a knee on the way up.